I'm a happy, happy gal today. One thing that puts an instant smile on my face is finding quality products for a great price - say, three items for under $100. Crazy, huh? Well, not right now when Abercrombie & Fitch is hosting its winter sale! Yes, 50% off every single item in stores and online. Pretty sweet deal. I must admit though that I had not shopped at A&F in quite some time. 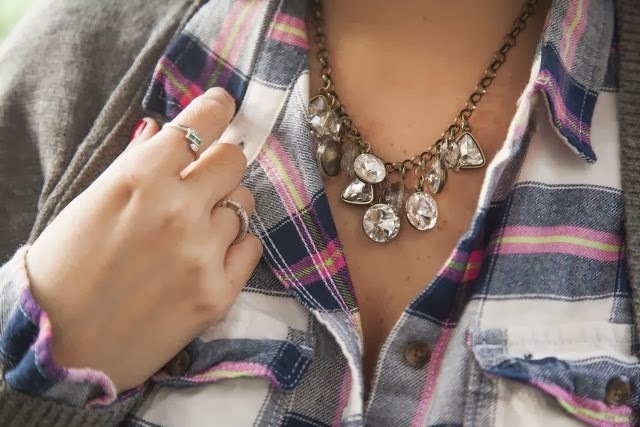 However, I was instantly smitten with this easy fit pink flannel shirt, this cozy cardigan and even this statement necklace that gives the outfit a little needed holiday sparkle. Don't waste any time and go check out Abercrombie's fabulous winter sale where I'm sure you'll find some serious goods for an unbeatable price! Compensation was received from Socialyte on behalf of Abercrombie & Fitch. All opinions stated in this post are my own. Thank you for supporting the brands that make Fashion Truffles possible!